The move of a sonic screwdriver from science fiction to science fact moves a stage closer, as the Telegraph reports on engineers from the University of Bristol developing a device that "is capable of moving and manipulating objects using only ultrasonic sound waves". We have developed a device that allows us to use ultrasonic forces to move small objects like biological cells around to sort them or to assemble them. We are using quite low forces to do this because we don’t want to damage the objects we are moving, but the technology is definitely real and there is potential to turn it into something like Dr Who’s sonic screwdriver. If we can increase the ultrasonic force and create a rotational force, then we could potentially undo screws. Essentially what you are doing is using the ultrasonic sound wave to twirl the air around to create an miniature tornado. There are a number of things that we can do to increase the force that can be applied. We would need to get the air moving extremely fast to apply enough force to a screw, but we could inject a dense gas into the area around the screw head as it would produce more friction. It has been the miniaturisation of the technology needed that has allowed us to produce the sonotweezers (the prototype device they have created). The sonic screwdriver may still be sometime in the making but ultrasonic technology is already making its mark in the medical and manufacturing arenas with some exciting results. Television’s favourite Time Lord could not exist without his trusty sonic screwdriver, as it’s proved priceless in defeating Daleks and keeping the Tardis in check. Now Doctor Who’s famous cure-all gadget could become a reality for DIY-ers across the world, say engineers. Ultrasonic engineers at Bristol University and The Big Bang: UK Young Scientists and Engineers Fair are uncovering how a real life version of the fictional screwdriver - which uses sonic technology to open locks and undo screws - could be created. Professor of Ultrasonics, Bruce Drinkwater, who is working with The Big Bang to inspire young scientists of the future, says the answer lies in ultrasonic sound waves. By operating the waves at frequencies way beyond the realms of human hearing, they can be used to apply forces to objects. The technology is already being trialled in modern manufacturing to fix parts together and ultrasonic force fields are being developed within the medical field to separate diseased cells from healthy cells. Professor Drinkwater and The Big Bang team are now exploring whether super powerful versions of these sound beams could bring Doctor Who’s iconic device to life. He says: "Doctor Who is renowned for bending the rules of science. But technology has radically moved on since the Doc first stepped out of his Tardis in the sixties. Whilst a fully functioning time machine may still be light years away, engineers are already experimenting with ultrasonic waves to move and manipulate small objects." Engineers are looking into how ultrasonic waves can be spun at high speed to create a twisting force similar to that of a miniature tornado, which could undo screws remotely. They have also experimented with rotating ultrasonic force fields which would act like the head of a real screwdriver. Doctor Who and DIY fans may still have to wait before they can add the sonic screwdriver to their Christmas wish lists. However, Professor Drinkwater hopes his work to make the impossible possible will inspire engineers, technologists and inventors of the future. "Doctor Who’s adventures have captured the imaginations of millions, young and old. And, however far fetched the Time Lord’s encounters may seem, there are engineers and scientists out there who are using their skills to bring the magic to life. "The sonic screwdriver may still be sometime in the making but ultrasonic technology is already making its mark in the medical and manufacturing arenas with some exciting results." Professor Drinkwater has teamed up with The Big Bang, one of the UK’s biggest celebrations of science and engineering, to inspire young people from all walks of life. Taking place at ICC London ExCeL from 10 – 12 March 2011, The Big Bang offers young people the chance to take part in a host of free interactive shows and workshops including Sky One’s Brainiac Live! and BBC One’s Bang Goes the Theory. It is also the ideal place to find out about the exciting career options available in science and engineering. The Big Bang hosts the finals of the prestigious National Science & Engineering Competition and also kicks off National Science & Engineering Week 2011. To find out more and book your place visit www.thebigbangfair.co.uk. In the meantime, we will have to make do with this sonic screwdriver, which is available in the shops. 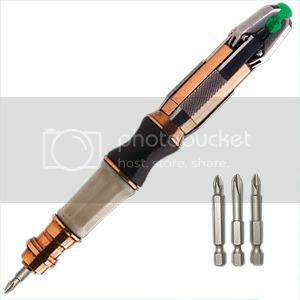 Designed in the style of the Eleventh Doctor's sonic, this version is a practical screwdriver with three interchangeable heads to accomodate a variety of household chores, but will also light up and 'buzz' as it is used!